Last week we talked about the pre-production process. Just to underline what we said - before you think about recording: rehearse, rehearse, rehearse! So now you have your 10 or so songs and you've made sure that, in terms of arrangement, structure and lyrics, they are the best they can be. At this point it might be a good idea to discuss the possibility of getting a producer on board. Most bands with a small budget will side step this option by either hiring an engineer with production experience or by producing the material themselves, or both. However, it is worth checking out a producer whose sole job is to concentrate on production. The producer's job is to work with the band to make sure their music is both professional sounding and commercially viable. At the end of the day you're going to have to sell it! Look up producers (the Hot Press Yearbook is a good starting point), talk to a few and if you find someone that suits you and your music then great. If you don't, well it's back to you and the engineer undertaking the production duties. 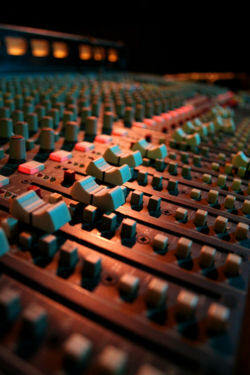 Make sure the engineer and producer hear all of your material before you start recording. Decisions on how the album should be approached should be made before you book the studio. So you've rehearsed and found a producer/engineer. That really is the dog work done. Once the right personnel are chosen, hopefully all other options will fall into place. The next piece of the puzzle is where to record. Do you want to hire a purpose-built studio? Or would you prefer to record somewhere else? Let's start with a purpose-built studio. No doubt we've all seen behind-the-scenes footage of your favourite band recording in a cavernous live room while their engineer is slaving over a huge desk with many lights and knobs. They are very impressive looking. Indeed, studios like Grouse Lodge, Windmill, The Cauldron, Sun and Apollo are places that this writer gets goosebumps about. But let's get away from the 'wow!' factor for a moment and discuss the real advantages and disadvantages of these studios. Purpose-built studios have the advantage of being sound proofed and sound designed, with all the recording equipment you will need under one roof. Some, like Grouse Lodge, even has accommodation, a pool and your very own chef! The disadvantages to a band on a small budget are all too obvious: the money. Prices for the mid-range studios start from €500 per day and can go all the way up to as much as €1500 per day. That's not including the engineer either! If you are to consider a studio to record in then you must be aware that you will be limited in terms of the amount of time you have, although for some bands a deadline can work very well. The other option for a place to record is to go mobile. Forty years ago The Rolling Stones started this with their studio in a truck; it produced some amazing recordings but it wasn't exactly a featherweight. Now, however, thanks to digital technology, all the studio equipment you will need will fit into a Volvo estate. By having your entire recording process mobile you can record anywhere. To rent a large 8-bedroom holiday home in the middle of the country will set you back about €900 for one week. Even if you factor in the cost of equipment rental, the savings are huge when compared to a studio. Aside from the cost, the other main advantage is that you are isolated from the outside world - no clubs, no Internet and no distractions in general. You'd be amazed at how the introduction of a friend or partner into the recording process can cause disruption! There are disadvantages, though. Number one is the blindingly obvious fact that you aren't in a studio. You have the equipment but not the fixtures and fittings. What that means is that there is no soundproofing and, more importantly, no sound designing. The soundproofing can be dealt with. If you are in the middle of nowhere you don't have to worry about noise levels, i.e. the sheep won't care about the noise and you hopefully won't hear them complain if they do! More important is the sound designing. The mid-range studio will have a few different types of rooms: a wood room, a stone room and a dead room most likely. The wood and stone rooms are for drums and anything you want to sound spacious, while the dead room for that close, intimate sound. Before you decide on a location make sure it has rooms that your instruments sound good in. Good starting points are solid walls, wood floors and some soft furnishings to calm the higher frequency reflections (i.e. echo). The tough one is the dead room, though. Often, creative use of those soft furnishings and some blankets can give good results. There is always a third option of combining the two. For example, if you want a certain drum sound that you feel only a certain studio will give you, then you can hire the studio solely for the drums and then disappear off to your hideaway to record all the rest of the tracks. A quick word of warning. This writer recorded in a haunted house recently. If you are easily freaked out, which I am, then make sure you get the history of the building before you rent it out! An engineer that is afraid to go asleep is a very grumpy engineer indeed! OK, so all the personnel are in place and you have a place to record. Next we get down to the business of recording.